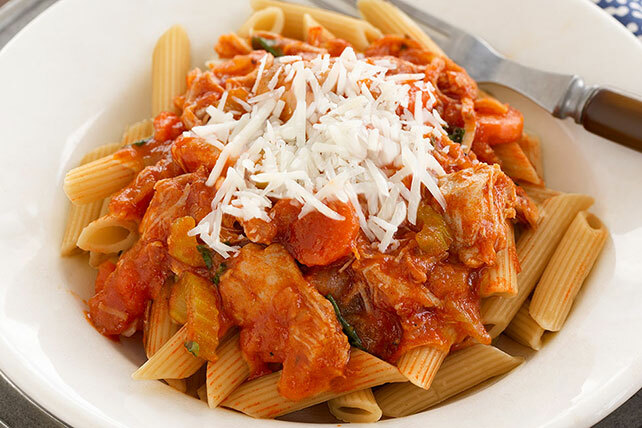 Just what you need after a long day: a slow-cooker chicken bolognese sauce that cooks all day—so all you have to do before dinner is cook the pasta. Place vegetables in slow cooker; top with chicken. Mix pasta sauce and dressing; pour over chicken. Cover with lid. Cook on LOW 6 to 8 hours (or on HIGH 4 hours). About 15 min. before serving chicken, cook pasta as directed on package, omitting salt. Stir basil into ingredients in slow cooker. Drain pasta; serve topped with chicken mixture and cheese. It is important to use pasta that matches the sauce you are serving with it. For this recipe, it is best to use short pasta with nooks and crannies that can help catch and hold the robust sauce. Serve with a mixed green salad tossed with your favorite KRAFT Dressing.